Lemme give you a super-duper quick review of what’s going on……. Dwight made Yoda. Harvey made Vader. Sara made Chewie. She found out about FunTime. Jabba and Leia stopped FunTime. We stopped a new enemy. 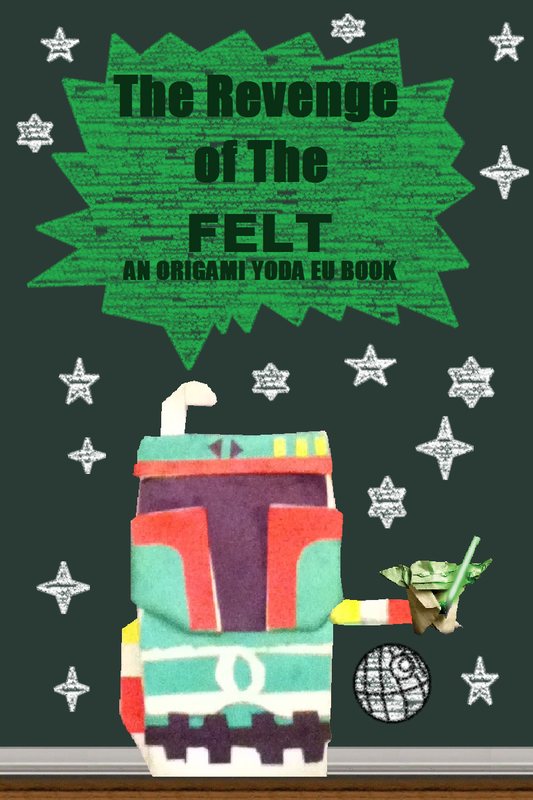 We met a kid with an origami Boba Fett. And he stole Origami Yoda. “…We’re doomed.” Lance joined in., with Origami C-3PO. “But, the odds of successfully making the perfect rescue are-” I cut Lance off. Our first order of business: uhh………..
Tommy’s Comment: Wow! I hate to admit it, but that was actually a smart move! And thanks. Now we know where to go next. . . . .
“What a piece of junk!” I exclaimed, as I entered Sven’s Fair Price Store. Every rack was filled with useless trinkets and doo-dads. Jen’s dad would’ve freaked. We found a big glass stand in the cashier corner of the store, which held a very realistic looking fake mustache. A couple of kids were walking inside. The one kid was wearing really fancy clothes, and the other guy was just kinda dorky looking. We ignored them. Walking up to the cashier, we met Sven. She’s actually very sweet. We talked about all sorts of stuff, and in the end, we were able to purchase the mustache at a DISCOUNT! Booyah for girl power! We walked out of the store, and examined our findings. Lance got a big pack of vintage baseball cards, all signed. Tommy got a rubber sticky-hand. And Kellen got those weird prank glasses. My muscles tensed. Someone was standing behind me. I was sure of it. Jack was giving the mustache AND Yoda to his Employer. I didn’t know what the mustache was for, but I knew one thing. If someone is gathering all these things together, it could get dangerous. Tommy’s Comment: So, we’re going back home……poor Kellen……will his allowance even cover all that? What. The. Heck. Happened. To. The. Qwikpick? The shelves were all rearranged, the paint on the walls went from red to blue, and. . . . . no pork rinds! I repeat! The Qwikpick no longer sells pork rinds! Dwight and Quavondo will freak! “Precisely,” Jack stood behind us. I jumped. “Hey, look man, we don’t want any trouble.” I tried to keep my voice level. And he was gone. So were all the Skittles. Not just that one bag, but all the other bags, too. “He must’ve wished for himself-and the Skittles-to disappear,” Amy said. “Well, now what?” I said. Harvey’s Comment: An Origami Yaddle from. . . . . oh. Oh no. Tommy’s Comment: Where is it? Harvey’s Other Comment: ….Tippett Academy. Dude, he’s going after Caroline. My mom drove us past Cascade Drive to pick up Dwight. Sara and Tommy briefly talked and hugged and all that disgusting stuff, while we got Dwight into the car. He said he wouldn’t let us go without him. So we played it safe and brought him along. He wasn’t staring blankly into space or mumbling “FunTime Style” or even squirming around in his seat. I’d never seen him this focused before. Captain Dwight just got promoted to Grand Admiral Dwight. When we got to the front doors of Tippett, Dwight bolted out of the car. “Dude! Wait!” Lance called. But it was too late. Dwight was already in full-speed Jedi Warrior mode. When we found him, he was sitting down, talking to Caroline. She looked a little upset, but mostly for Dwight. We talked with her, and she told us that about an hour ago, some guy came over to her, and politely asked her to borrow her Origami Yaddle. She nicely declined, so he said “I’m really sorry,” and snatched it from her. She tried following him, but he popped something colorful into his mouth and disappeared. “What?” Caroline rested her head in her hands. “They grant any wish you give them. Now he can use them to teleport.” Tommy bent over to examine something. “And look,” he said. “It looks like he dropped one.” He popped the Skittle into his mouth, and with a blinding flash, Tommy and Dwight were gone, leaving me, Amy, Caroline, and Kellen to get back to our regular schedule. “I wish for me and Dwight to get to wherever Jack is right now,” I silently wished, as I popped the candy into my mouth. I braced myself for something weird. When I opened my eyes, I was back at McQuarrie. “Look,” Dwight pointed ahead of me. This isn’t my last mission to McQuarrie Middle School. Jack’s words echoed in my head, as I saw him walking through the cafeteria, straight towards Harvey. “Harvey! Look out!” I cried. Jack must’ve been trying to capture Darth Paper! Jack, instead of lunging at Harvey, gave him a high-five, and started taking stuff out of his backpack. The Mustache. The Skittles. Yaddle. Yoda. “Harvey. You’re the Employer,” I felt a cold shiver run down my spine. “They are! This isn’t anything bad or dark, Tommy! This is a. . . . . . .
“Happy birthday, Dwight!” I shouted. Quavondo, Sara, Cassie, Mike, and Murky all started chewing on Skittles. Party balloons, a birthday banner, and a huge cake appeared out of thin air. “What?! ?” Tommy got that dumb look on his face again. Ha! Priceless! Dwight looked–well, okay, Dwight never really smiles–but he looked happy. He went up to Harvey, and actually–get this–hugged him! So, the mystery of Boba Felt was solved; Dwight was happy; Harvey (uncharacteristically) gave Kellen a refund on his allowance; and I got a BIG slice of cake! ……….I just wish it didn’t taste like skittles. Haha well apparently, Fake Mustache never happened in OY EU continuity! Heh. Did you see my new site yet? It’s really cool. Yep I did! It was epic! the perfect sequel! at the beggining i was like “JC! jacks not evil arggg” but when i got to the end it was perfect!! Haha I’m glad you liked it! After all, you wrote the original! I’m honored to have made a good sequel by you! JC, when will i become an admin? Teleporting skittles? Traveling out of state? 9Not that it’s unusual, but I mean, just like that? ASK to borrow the car?) The overall story was good though. I thought teleporting skittles was kind of something up Tom’s alley, like the Fountain of Poop or the Fake Mustache! Though……. You do have a point. That’s actually why I changed the EU a lot. I might redo that writing part. Thanks for the input! I thought stories were supposed to have instructions with them. If you read the home page, it says stories need instructions with them. &Jarrett the reason you need to send instrux is so. JC can fold the cover star! Love the skittles part! If only they were really like that. Yay! 😀 And, I think I messed up on some stuff near the end of it…. if you see it, could you fix it? Um, actually, I couldn’t keep all of it. Jacob is officially a good guy. As far as I know, he’s not going Dark Side any time soon. Who did you change it to?